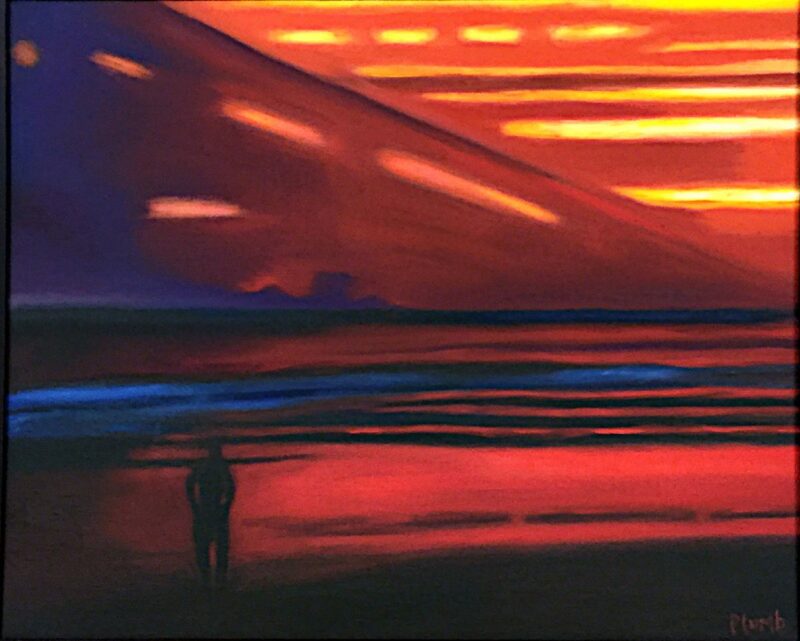 Carol Plumb returns to McAllen with a series of oil paintings that reflect the spiritual sense of calm found around the coastal areas of South Texas. 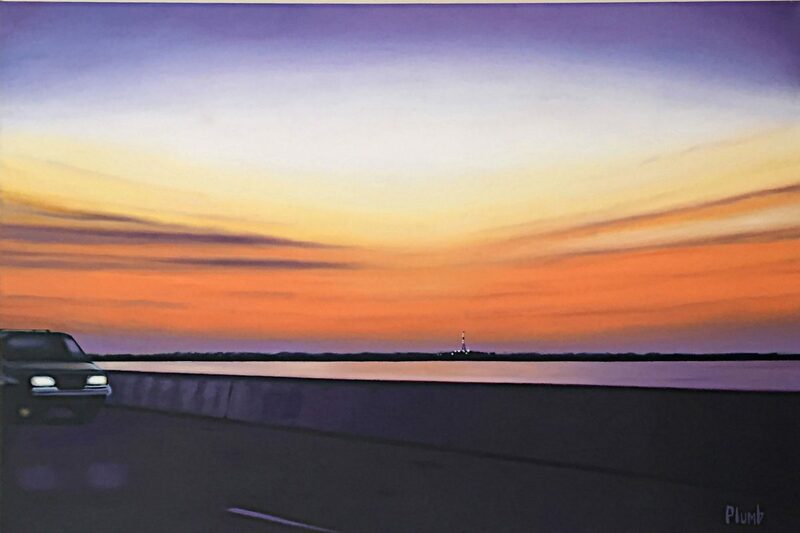 A well-known local artist who focuses on the rural landscape, the dialogue Plumb began a decade ago with the Texas coast has become deeper with her new exhibition of oil paintings, “HorizonLine,” on display in the McAllen Public Library’s Lobby Gallery. Her previous exhibition here was also set in the local coastal environment, but that body of work featured a subtle — albeit subconscious turbulence — churning of the bay waters and reconfiguring the sky. New works have ironed out the turbulence and offer a clarified perception. Distinctions between the mood of the previous exhibition and this new one are notable. 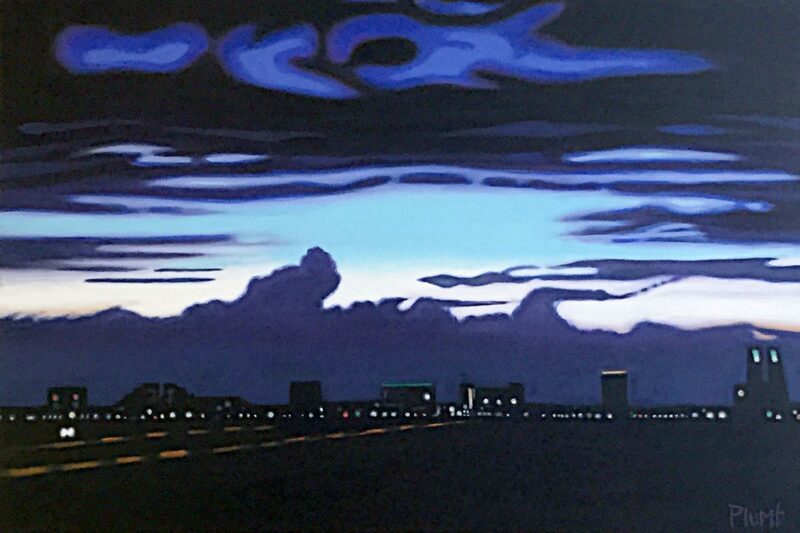 “Clouds Over South Padre Island” is reminiscent of the earlier works. Here, human habitation is suggested on the lowered horizon, while the sky is alive with unpredictable and ominous formations. The newer work, “Mesquital l,” eases our minds and vision with a calmer experience. “Raymondville Carnival” spans the emotional bridge between the two states of mind. 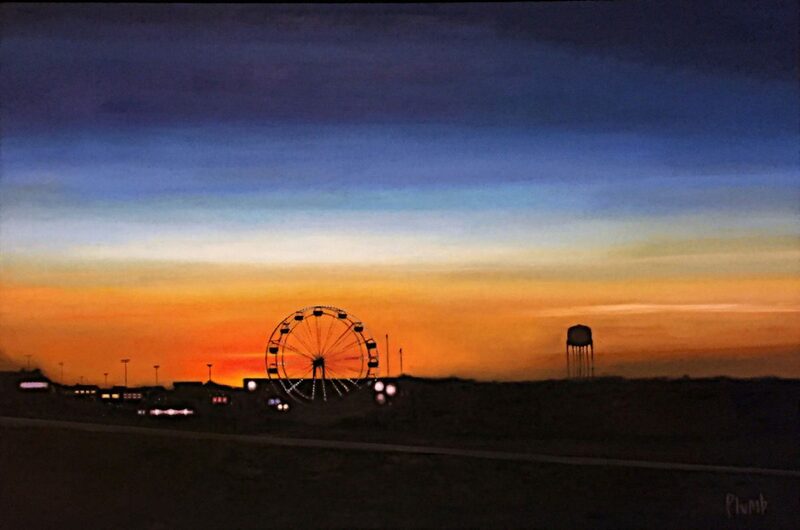 In this painting, the horizon line is broken by a Ferris wheel and water tower that cut into the late evening orange sky — the possible result of distant volcanic activity; the hot orange placed against the blackened landscape is disturbing despite the efforts of restful horizontal color layers. "Mesquital II" by Carol Plumb. “Sunrise ll” presents an abstracted vision of the bay with clouds and water taking on arbitrary horizontal formations, without showing points of natural resolution. Although there are still a few paintings in this show that possess an undercurrent of tension, recent works have moved away from underlying anxieties. 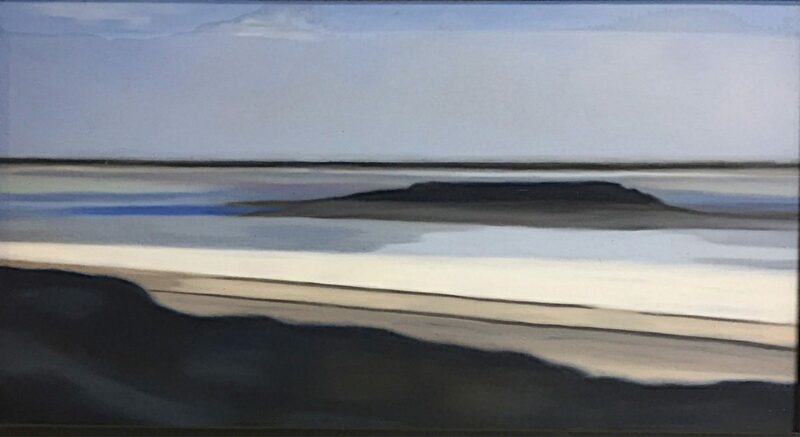 Several paintings display smooth horizontal and near horizontal bands of landscape, water and sky that reflect quiet resolution. 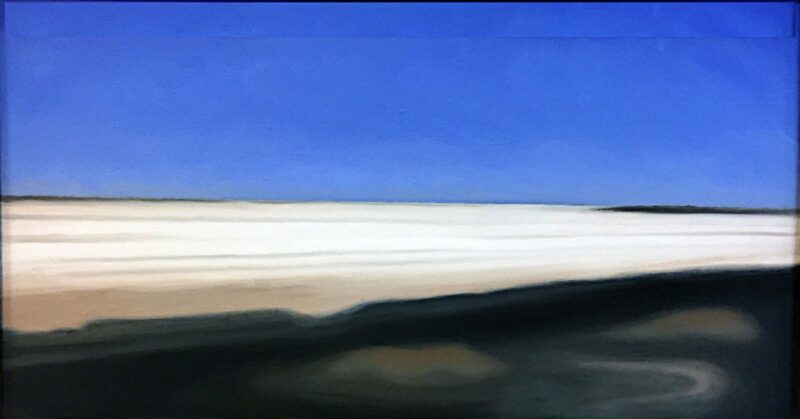 During that year, her canvases began to demonstrate nearly equal divisions between the land or sea, and sky, reflecting a visual and psychological equanimity. We see this equanimity in the painting, “Mesquital ll”. Although the land repeats in a sandbar, it is at home in the water. White caps that most artists see as violent and breaking shapes have been tamed into a smooth, white band abutting an equally smooth band of wet sand. The sky has been tamed. Order and control reign supreme as Plumb gives us a version of the world that we believe exists on get-away-from-it-all vacations. Paintings speak of frozen moments of the primordial play of light upon an uncluttered earth. The world in “HorizonLine” is devoid of human presence; it is the mythical memory of the coastal world before plants and creatures began their struggle for survival. “Highway 48” becomes an ancient prophecy in time-without-definition as a car is shown stealthily moving into a picture plane of pure serenity. Now it seems that she has found it.